My harshest culinary critic is my brother. A former sous chef at Longrain, I often get lots of great cooking tips from him, as well as lots of criticism. So, when he declared that the turkey I had made for our (early) family Christmas lunch yesterday was the best he’d ever tasted, I decided it was worth sharing… so here’s a little gift to all my readers for this festive season. Thank you for reading my posts this year. I hope you all have the most wonderful festive season. If you’re interested in a gift that’s bit more tangible, I’m giving away one $50 mylo-dee gift certificate every day until Christmas. Just “like” the mylo-dee Facebook page or share one of the mylo-dee blog posts to be in the running to win. 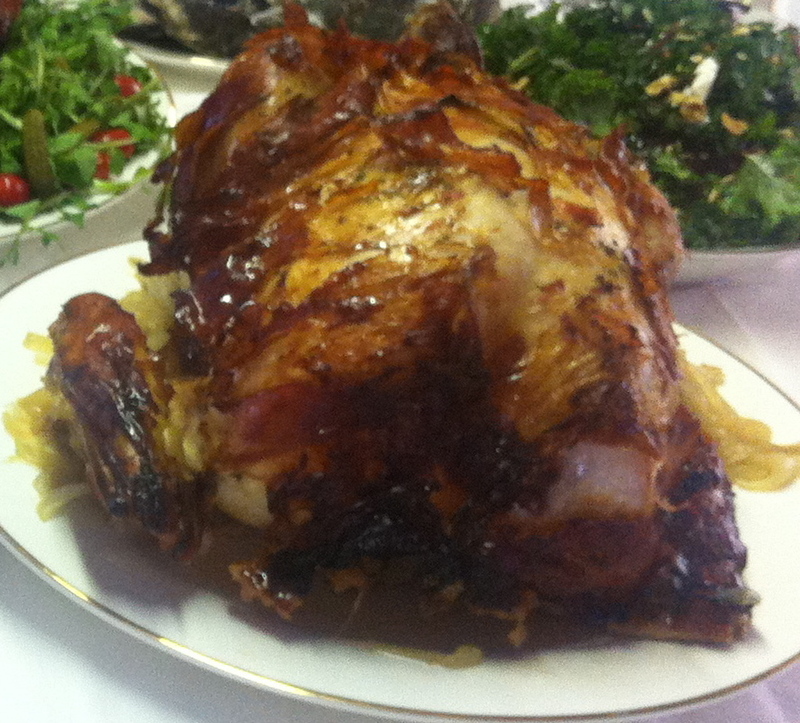 This recipe was inspired by the turkey recipe in the Gourmet Traveller. I used clean ingredients where I could. I was feeding 15 people, so I used a much bigger turkey – but the trick in ensuring a juicy turkey is brining the turkey in advance. I promise, it’s not as difficult nor as time consuming as it sounds and it makes all the difference! 1. To brine the turkey, combine all the ingredients in a large saucepan and bring to boil, stirring to dissolve the sugar and salt. Reduce the heat and simmer for 5 mins. Cool to room temperature. Put turkey into a non-reactive container (i.e. anything non-metallic, to ensure you don’t get a metallic taste during the process) and cover it with the liquid. Refrigerate overnight. Before roasting, drain turkey completely of all liquid and pat it dry inside and out with absorbent paper. Rest it to room temperature. 3. Make the stuffing. Whizz a day old loaf of sourdough bread in the processor to make the breadcrumbs and place it into a large bowl. Melt butter in a large medium saucepan over low-medium heat. Add the onion and garlic and stir occasionally until transparent. Add rosemary and stir to combine and set aside to cool. Once cooled, add the butter mixture and the remaining ingredients to the breadcrumbs and combine. 4. Place the onions onto a large roasting pan and place the turkey on top of the onions. Fill the cavity with the stuffing mixture. I like to use my hands to push it deep into the cavity. Truss the legs with kitchen string. Pour the wine and stock into the pan. Rub the turkey with the butter, sprinkle on the rosemary and layer the pancetta over the entire turkey overlapping the pieces as you go. Cover the turkey with foil and roast. I basted every 20 mins for the first hour. 5. If you have any stuffing that won’t fit into the turkey, place it onto a baking tray and cover it with foil. Bake this for 45 mins with the turkey (put it in in the final 45 mins of turkey baking). 6. In the last 45mins of roasting, remove the foil to golden the turkey and crisp up the pancetta. The turkey is cooked when a cooking thermometer pushed into the thigh reads 75C (or when the turkey is golden and juices run clear when the thigh is pierced with a skewer) – approximately 3 hours 45 mins. Remove the turkey from the oven, cover with foil and allow it to rest in the pan. 7. Make the cherry preserve but stirring the sugar and vinegar in a small saucepan over medium heat until the sugar dissolves. Add the cherries, shallot and rosemary. Simmer until the cherries soften and mixture thickens. Season with a bit of salt. Set aside to cool and serve with the turkey.